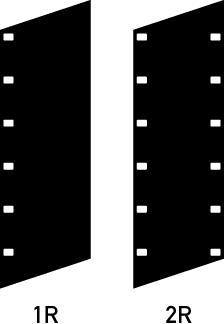 You can get 16mm film perforated one of two ways, 1R or 2R. Most cameras can use either type of film. All you need to know is that the older, less-common 2R is symmetrical, while 1R is not. This spring, I was introducing my cinematography class to the use of 16mm cameras. Before they shot their own projects, I wanted to give them a chance to run some film as a group. I knew I had a hundred-foot roll of black-and-white Double-X that had been sitting in my freezer for years, and it seemed the perfect occasion to use it up. I took the film to class one morning and loaded the roll into our beautiful, state-of-the-80s Arriflex SR2 Highspeed—noting with some concern that the polyester base was quite old and brittle—and we went outside to shoot some footage. I stood in as the subject, and my students operated the camera. It was four years earlier, almost to the day. I had been out of college for nearly a year, living with my parents, seeing little success as a freelancer. Kathy, my film school friend and former ill-conceived love interest, had invited me on a road trip with a mutual friend, a talented but similarly-unsuccessful illustrator. The purpose, she said, was to force us back into some level of creative productivity. I couldn’t afford to go. None of us could. Of course I said yes. When Kathy arrived, she brought along several hundred feet of Double-X. She was sick of the film industry, and so she gave the film to me. I shot some of it on the trip, and kept the rest in my freezer for some unspecified future project. The trip was, for reasons that I haven’t really been able to articulate, one of the most significant events in my creative life. Something about the shared hardship of three underemployed artists traveling across the country for no reason and sleeping on an air mattress in the back of the car shot me through with an urge to make art for the first time since film school. When I got back to Colorado, I stuffed a towel under the bathroom door, turned out the light, and developed the film in my bathtub. It was a tangled mess, sloshing around those pungent-smelling chemicals in total darkness. Fun. A couple weeks later, energized by the whole experience, I sat down and wrote what would later become the feature film Branches. Last week, we got the film back from MovieLab, along with a hard drive full of transfers. I plugged it into the classroom TV and we gathered around to watch our footage for the first time. The first file on the drive was our camera test. The first shot was something I didn’t recognize. Moreover, it appeared to be upside-down. A few seconds in, it became clear that the footage was also running backwards. Some sort of lab error? Then there was another shot. On top of the first one. It was me, walking away from the college. And upside-down beneath me, the Golden Gate Bridge: this was a double exposure. Somewhere along the line, I had mislabeled a roll of film from my trip as UNEXPOSED, and had never developed it. 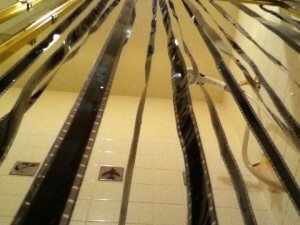 So it had run through my camera once, head-first, and wound up with the end of the film on the outside of the roll. Because it was symmetrical 2R film, I didn’t notice the issue four years later as I loaded it into the camera a second time. Furthermore, the two scenes wound up overlaid head-over-tail, meaning that one scene was running upside-down and in reverse relative to the other. I was transfixed. Occasionally the two images would interact in unexpected and delightful ways. Here I was, walking away from the college—over and over, as the setting sun rose in reverse behind me, silhouetting trees and brightening the sky. Failure. Adventure. Disaster. Bad love. A relentless bedbug infestation that marked the most hideous six months of my life. Good love, and the exhilaration that comes with it. Success that becomes stagnant, that merges with frustration and becomes another day, on top of another year, until I don’t even know what this is anymore, this success that I wear around my neck and allow to define me. You’re not trapped anymore, Jason said. And I believed him. After three exhausting, thrilling years running the film program, I’m leaving my job. Today is my last day. My time here has been a long string of successes and failures and some very good times. I’m proud of the work I have done here, and I’m deeply grateful for the opportunities I’ve been given. But I have become comfortable, and that is the death of art. I haven’t made a film in three years. That’s horrifying. Branches still sits unfinished. I need to do something about that. I don’t know where I’m headed next, and I am terrified. But I’m not trapped between those two layers of film anymore, and anything is possible.